Among intubated patients, we can often control the pO2, pCO2, and pH. Sounds great. Unfortunately, we also have no idea which numbers we should be targeting. Should we target a normal pH, or permissive hypercapnia? Should we shoot for a normoxia, try to maximize the oxygen delivery (hyperoxia), or allow for permissive hypoxemia? Nobody knows. We check ABGs and tweak the ventilator, but it's often dubious whether this helps our patients. Although oxygen is necessary for life, it's also involved in burning stuff (whether that may be a forest fire or oxidative tissue damage). There is increasing recognition that hyperoxia may be harmful, particularly following cardiac arrest and myocardial infarction (e.g., the AVOID trial). This leads to the current study: is targeting a high oxygen saturation harmful in critically ill patients? Background: Oxygen physiology and the silliness of targeting a high oxygen saturation. Thus, the amount of variation in oxygen saturation is minimal compared to the other variables which make up DO2 and VO2. Changes in oxygen saturation within the 85-100% range will have relatively little impact on the DO2/VO2 balance (compared to other variables, which are largely unmeasured). We focus on the oxygen saturation because it's on the monitor and blinking in red, but it is generally a minor player in oxygen balance. Given that oxygen saturation doesn't have much impact on oxygen delivery, excessive focus on saturation can actually be harmful. For example, if we crank up the PEEP to increase the oxygen saturation, this may actually drop the cardiac output, with an overall negative effect on the DO2 (more on this here). For ventilated patients without severe hypoxemia, targeting a high oxygen saturation may still be harmful. Targeting a higher saturation leads to higher FiO2 and PEEP. Even if these settings are only minimally elevated (e.g. FiO2 55% and PEEP of 8 cm), this may impair ventilator weaning. Most weaning protocols require that the patient meet certain FiO2 and PEEP cutoffs prior to weaning, so even a trivial increase in these parameters may delay extubation (1). Girardis M et al: Effect of conservative vs. conventional oxygen therapy on mortality among patients in an intensive care unit: The Oxygen-ICU randomized controlled trial. It was terminated early following unplanned interim analysis in the wake of an earthquake that damaged the hospital, impairing enrollment. It is a single-center study, which may amplify the effects of how a particular group of physicians and respiratory therapists respond to oxygen levels. Patients with COPD exacerbation or severe ARDS were excluded, which could limit generalizability. There were baseline imbalances between the groups, with patients in the conventional group being sicker. The endpoint of ICU mortality may be less robust than hospital mortality or 90-day mortality endpoint. As discussed above, my expectation would be that targeting a saturation of 97-100% would cause problems among patients on mechanical ventilation, including delayed ventilator weaning. This seems to have happened. Patients in the conservative oxygen group were weaned faster (with an average of 24 more ventilator-free hours, p=0.02). A 9% absolute mortality benefit is surprisingly high, but the 95% confidence intervals of the mortality benefit are wide (1.7%-15%). Mortality benefit may have been increased artificially by baseline imbalance between the groups and early termination of the study. If your center is currently targeting an oxygen saturation of 97-100%, then this study would suggest that you could reduce your oxygen target. However, it seems that relatively few centers are targeting oxygen levels this high. Furthermore, there is already ample evidence in the literature that targeting lower oxygen levels is safe. If your center is currently targeting oxygen levels below the 97-100% level, then this study supports your current practice. It seems that most units will be included in this second group. However, limitations in study design suggest that this study by itself shouldn't necessarily drive changes in practice. Hopefully the multi-center ICU-ROX study by Dr. Paul Young of the ANZICS study group will bring more definitive answers. The Oxygen-ICU trial found benefit from a conservative (94-98%) oxygen target when compared to a liberal (97-100%) oxygen target. It is conceivable that targeting a lower oxygen saturation led to lower PEEP and FiO2 levels, facilitating earlier extubation. This study suggests that targeting a saturation of 97-100% may be too high. However, most clinicians may already targeting levels lower than this. ICU-ROX trial discussion with Paul Young (Critical Care Reviews Podcast). Agree. The point is to set an upper limit as well so patients don’t hang out with sats of 98% on 50% fio2 all day long!! I'm not saying that this should happen. One of my tricks for getting patients off the ventilator is accepting a lower oxygen saturation. Patients who are hypoxemic but otherwise ready to be extubated (e.g. from a work-of-breathing standpoint) can frequently be extubated to high-flow nasal cannula, as discussed previously here. I will go out on a limb to say that this isn't a case of circular logic, but rather Bayesian reasoning (this allows me to term my biases as “prior probabilities”). 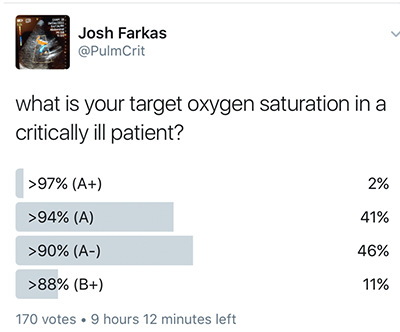 Many times RTs will look at ABGs to see if a pt can be extubated at my institution, not sure this really helps in most cases. They also give a lot of importance to PaO2, so despite a pt having acceptable O2 sat if the PaO2 is then below 70 this becomes an issue, though from the DO2 equation it seems SaO2 plays a big role and NOT PaO2 in oxygen delivery! Further the PaO2 can be lower than expected if blood is not properly frozen or there’s a delay in transport to the lab, increased cell counts due to scavenging phenomenon, acid-base disturbance etc. So I tend to give more importance to the O2 sat. Do you agree? I’ve basically stopped getting pre-extubation ABGs. The main reason to get an ABG prior to extubation is to make sure that the patient isn’t developing occult hypercapnia. A better way to rule this out is probably to follow the end tidal CO2 trends during the spontaneous breathing trial and prior to extubation. I don’t think an ABG adds anything to someone paying careful attention to trends in the saturation, etCO2, minute ventilation, respiratory rate, tidal volume, and clinical appearance of the patient. With regards to PaO2 vs saturation, this reminds me that I have an entire blog about this I need to post, hopefully soon. Long story short, I completely agree that the oxygen saturation is the way to go. As long as the oxygen saturation waveform looks good, its questionable whether the PaO2 adds beneficial information (as opposed to noise). More on this soon hopefully.